I have created and released two more WP quiz games in Windows Store by reusing most of the code base from my game Quiz King. is an English vocabulary quiz game with 2600 words. The trial version has the same content and features as the full edition but with some ad banners. Please download Word King at the store, try it out and rate it. 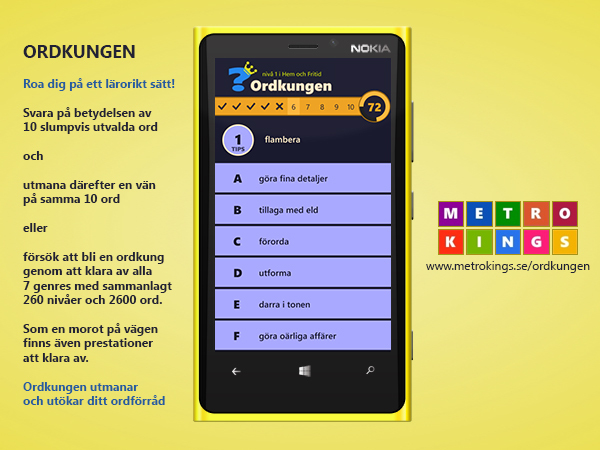 More info can be found at www.metrokings.se/wordking. try the epic quest to become a Word King by completing all 260 levels with 2600 Words. As an added challenge, try to complete all achievements in quest mode. Have fun and improve your vocabulary! is a free Swedish vocabulary quiz app with 2600 words for those of us using the same language as the Swedish Chef. 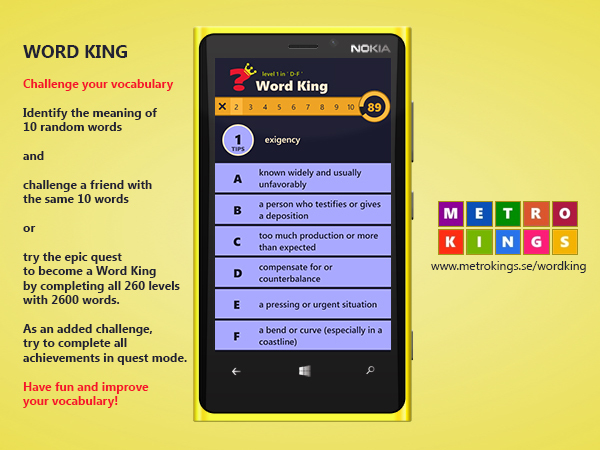 Please download Word King at the store, try it out and rate it. More info can be found at www.metrokings.se/ordkungen. Roa dig på ett lärorikt sätt! försök att bli en ordkung genom att klara av alla 7 genres med sammanlagt 260 nivåer och 2600 ord. Som en morot på vägen finns även prestationer att klara av. Wow that looks really cool, I will have to try it out. Is it windows only?